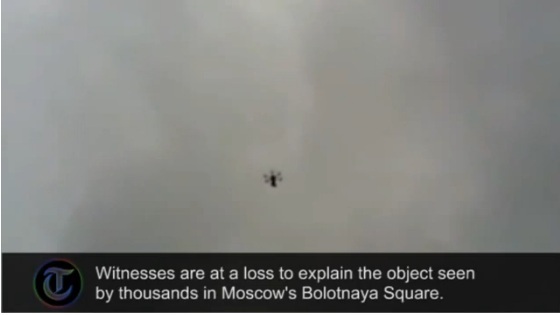 Video footage shows an unidentified flying object hovering above protesters in Bolotnaya Square in Moscow. Witnessed by hundreds of pro-democracy protestors in the Russian capital's Bolotnaya Square on Saturday, the unidentified craft drew confused stares. Clearly not a helicopter, the silent UFO pulsated coloured lights and had five extended tendrils or pylons emanating from the body of the vehicle. Onlookers, protesting against election results, climbed trees to grab a closer look at the mysterious craft which seemed to be observing the 25,000 people who had made their way down to Bolotnaya Square to protest.